Built in honour of Ireland’s patron saint between 1220 and 1260, Saint Patrick’s Cathedral offers visitors a rich and compelling cultural experience and is one of the few buildings left from medieval times. Jonathan Swift, author of Gulliver’s Travels, was Dean of Saint Patrick’s Cathedral in the 1700s and he is one of many burials on site. The cathedral is world famous for its choir which still performs daily during school term and the Lady Chapel. Dating from 1270 the chapel has been restored to its original glory and now features the Lives Remembered exhibition marking the centenary of World War I. 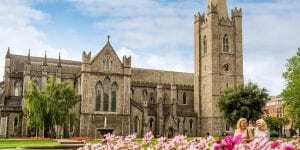 Guided tours of the cathedral depart regularly throughout the day or download the free app from the St Patricks Cathedral website for self-guide tours.